Endurance exercise is one of the hardest types of exercise to do, mainly because it involves you pushing yourself for many long hours. Running a marathon will leave you a mess of sweat and tired muscle, and throwing up at the end of an intense marathon is something that happens even to higher level athletes. To maintain a supreme level of fitness, whether you are a swimmer, runner, or biker, requires a considerable amount of dedication to the task at hand along with the mental fortitude to push yourself to the finish line. 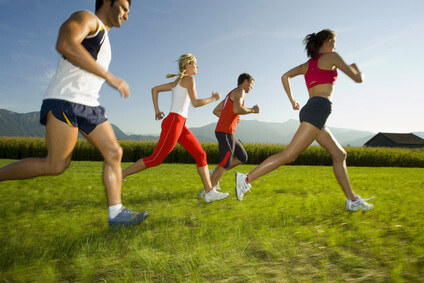 Endurance exercise is similar in the sense that it involves intense cardiovascular exercise. Therefore, the carryover from one type of exercise to another is great. Swimming a lot will help you to be a better runner, and vice versa. It is a good idea to mix things up and do a lot of different endurance exercises because it will keep you from getting bored with any one in particular and will also make you skillful at many different exercises. It can be a great feeling to know that you can easily run 10 miles, swim 3, and bike 50 whenever you want to. Indeed, those are numbers that will impress, because the average person cannot get anywhere near them. Endurance exercise can be done just about anywhere, and that is one of the reasons why it is so appealing. You could choose to run on the treadmill at home or use the stationary bike to get your hours of endurance exercise in. There are even plenty of endurance exercises you can do without any machines, such as running in a spot, skip rope, or jumping jacks. All of these exercises will get the blood pumping through your body and your heart will need to work hard to keep up, but later on it will adapt so that the exercise that seemed so difficult in the beginning will seem about as easy as taking a walk. This rapid progress will fuel your desire to get even fitter. In the same way that good sleep and nutrition will help your efforts to build muscle, they will also make you fitter and more capable of handing an intense endurance sport, so make sure to give your body plenty of both. Try to get at least 8 hours of sleep every night and do what you can to ensure that it is quality uninterrupted sleep. As far as food goes, always avoid processed foods, junk foods, and anything high in saturated fats. The best kind of food for endurance exercise is complex carbohydrates. This is why a lot of runners will bring along a trail mix or several cereal bars with them – these foods provide quick energy to keep your body working at an optimal level. When you are an elite endurance athlete you will constantly be looking for new challenges. That marathon you just ran could have been extremely difficult, but afterwards you might think you have the ability to run up a mountain or take on a triathlon. The reality is that with proper training, good rest, and good nutrition, your body can do amazing things.